It has been well-established that I am not an outdoorsy girl. But even if I have on the right clothes, odds are that once I get in the actual outdoors, something will go horribly awry. Like that time in 11th grade when my youth group went on a hayride and everyone was swinging out over a pond on a rope, and I wanted to be a good sport so I swung out over the pond, too, only my hands slipped and I fell into said pond and jammed all the fingers on my right hand. Over the years I’ve learned to accept that I’m just more of an indoorsy girl. My idea of going on a nature hike is to look at pictures of a nature hike on my computer while I sit in an air conditioned Panera with a big mug of coffee (two Equals, heavy on the half & half) and a large piece of plate glass separating me from all the nature. Just as the Good Lord intended. Now here’s a lesson you can take with you for the rest of your earthly days, and you don’t even have to pay me for it: “open air” is some fancy travel agent talk for WE AIN’T GOT NO AIR CONDITIONERS, Y’ALL. However, given what we’d recently seen in Kampala, I was able to quickly put the no air conditioner thing in perspective. Not to mention that I was on a once-in-a-lifetime trip with some of the best people I’ve ever met in my whole life. And so if the Lord wanted to use my time in Africa to rid me of any freon-related strongholds, then I was not going to get in His way. As it turned out, the lodge’s electricity came from a generator, and they turned off the generator three times a day. For those of you who are keeping score at home, that means there were three times a day when the ceiling fans didn’t work because, funny thing, CEILING FANS REQUIRE POWER. Honestly, I didn’t even notice the power outages during the daytime. We weren’t in our rooms a lot, and between the hiking and the ferry riding and the river exploring and the animal watching, there just wasn’t a lot of time to sit in the room and think about how you couldn’t turn on the TV if you wanted to, only OH WAIT, THERE WERE NO TV’S THERE, CLEARLY I WAS TRICKED INTO CAMPING. The first night at the lodge we had an absolutely delightful dinner, and once Shannon and I got back to our room it dawned on us that the generator was going to turn off around 1 in the morning. Which meant that the ceiling fan would not be operating. Which meant that between the mosquito nets surrounding our beds and the lack of air circulation, there was no way we could possibly continue to breathe normally after 1AM. After a considerable amount of deliberation, we decided to sleep with the sliding glass door open. In retrospect this was probably AN INCREDIBLY FOOLISH DECISION, but at the time we believed that leaving the door open was a stroke of brilliance because fresh air trumps no air at all. Every single time. She made an excellent point. Now in our defense, Shannon and I were both English majors at our respective colleges. And while I recall taking courses in transformational English grammar and Shakespearean poetry and whathaveyou, I was never required to take a course in How To Stop A Monkey Attack. I doubt that Shannon was, either. So we were both dealing with a pretty limited skill set in terms of How To Combat The Nature. So we talked about some different solutions, and as we discussed those solutions – none of which, interestingly enough, involved sleeping with the door closed – I wandered into the bathroom so I could wash my face and brush my teeth. I kept thinking about what it would be like to wake up and see a real-live monkey on the other side of my mosquito net, and I decided that it would probably be a little alarming. And I decided it would probably make me scream. Now I can’t speak for Shannon, and I don’t know this for sure, but I’m fairly certain that she was having the same thoughts. Because when I walked out of the bathroom and looked at our open doorway, this is what I saw. Internets, I give you Shannon’s Monkey Alarm (patent pending). For the record, I nearly wet my pants when I saw it. Because monkeys? They can jump. From one tree to another tree, even. 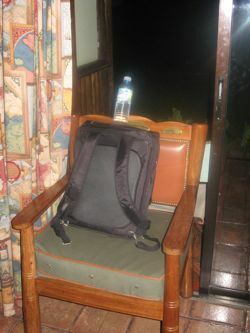 And so the notion that our two foot tall chair WITH A BACKPACK AND WATER BOTTLE ON THE SEAT would serve as some sort of Monkey Deterrent made me laugh until I cried. Shannon’s rationale was that if a monkey ran into the chair, the water bottle would fall and wake us up. And that made perfect sense to me because then we would have plenty of time to, I don’t know, SCREAM AT THE MONKEY? Or to run and jump in the closet while we SCREAMED AT THE MONKEY? Or – and this, I feel, is the most likely scenario – to try to hoist ourselves up to the ceiling using only our mosquito nets, all the while SCREAMING AT THE MONKEY? But never let it be said that English majors don’t know how to improvise. Because I’ll have you know that before the night was over, Shannon had TOTALLY revised her original Monkey Alarm (patent pending) design. She recognized that we needed something on top of the backpack that was a bit more hefty and stable than the bottle of water. So she replaced the water with a bottle of sunscreen. We found great comfort in that modification. And we slept the sleep of angels. Because NO WAY a monkey gets past a bottle of sunscreen, y’all. I feel certain that any respectable English major would agree. I with you on the monkey-phobia. They freak me out! Love your ingenuity! That is quite possibly the funniest thing I’ve ever read. Also, I love that someone someday will do a Google search for “How to stop a monkey attack” and be directed here. Your gift of service knows no bounds. No question, no monkey would mess with you. Or your blogger buddies in the next room…. Oh my word! You two ladies really did have life changing experiences in AFRICA. Yes, Sophie – it appears you were tricked into camping (we consider camping staying at a motel without remote controls on the tv). The Society for the Prevention of Monkey Hysterics will be a knockin’ at your door – those monkeys ALL came up – looked at the monkey barrier and laughed so hard they were falling out of trees, into the swimming pool and generally injuring themselves. Actually – the sunscreen ploy might get you off a little bit – ’cause we’ve seen those monkeys in zoos with the very red — NEVERMIND. You are the funnest person – and those Ugandan BloggerBunch seem to confirm that. As an English major (although my husband likes to correct me and say, “English graduate”) I approve of the modified sunscreen contraption. I’ve been a lurker for awhile, but I couldn’t resist your call to all respectable English majors. Non-respectable English majors need not apply. I am laughing so hard that tears are running down my face! :) My DH just keeps shaking his head at me. Hey, as the daughter of two English teachers, I feel qualified to say that your monkey alarm is one of the funniest things I’ve ever seen. :) Thanks for the laugh tonight- I needed that! I, too, am answering the call of the English major. I want to know the symbolism behind the water bottle. When you changed to the bottle of the sunscreen did that signify a change in your thinking? What were the monkeys? Were they real or just a metaphor for something much deeper….I think I would have hung your Fundana on top of the bottle, for added security and a burst of color. This is hilarious! I’m trying to picture how it would feel to wake up and see a monkey looking at you! At least they aren’t vicious animals! It would probably want to just crawl in bed with you and cuddle! ha! What about the LIONS! or the ELEPHANTS! or the CHEETAHS! Yeah. Me. English major. And it woulda worked, y’all! In fact, monkeys probably approached the door, took one look at the Clever Monkey Trap and ran off with their tails between their legs thinking, “Stinkin’ English majors! Foiled again!” Think about it! I bet that’s what happened! I will also add that you take your coffee just the way my husband does. He says he likes his coffee like he likes his woman, white and sweet. Tee hee. Please warn us when hilarity is coming, because I am snorting and can’t breath yet. If no monkeys entered the room, the trap worked. This is fall out of your chair laughing and continue to roll on the floor laughing funny. Oh my word, how I’m laughing. The picture was the best. Loved it. I have a perma-grin and an English degree. Neither are useful in combatting monkeys. You girls are just lucky there wasn’t an attack or a thirsty, fare-skinned critter around. I am laughing so hard that I think i might have woken my 2 year old up…that is hilarious! I am sure all monkeys steered clear of your room in fear of the sunscreen bottle! My husband wants to know what the heck I keep laughing about and why it won’t just end already! This was hysterical! Both you and Big Mama were at the top of your game today. Still laughing about how none of your solutions involved closing the door…priceless! Oh my word, this just CRACKS ME UP. Just seeing the water bottled perched like that is hilarious. Boy did you guys ever show those monkeys! Seeing as monkeys are actually pretty smart, I bet he would have been too busy laughing at ya’ll to attack. Ohhh…thanks for the laugh. I needed that! Hands down the best post ever written!! Oh BooMama – We can always count on you to bring the funny. Love, love, love this post! Can you believe you could have gone through your whole life without a monkey alarm story to tell? What a shame that would have been! I do think I heard on the Discovery Channel that monkeys HATE sunscreen. And water. OH MY WORD! You two take the cake! Thanks for sharing your real life experiences from the African bush =) This was at least a 3-snorter! And, given that this time of year usually finds me camping in the Sahara, I will share a short story with you. Once I went to a women’s conf in Senegal, and happened to room next to the speaker. She was all freaked about the cockroaches in her room and said to me, “I’m not like you. I don’t deal well with bugs.” I found this hysterical, since I had just been freaking out about a potential mouse rustling in the corner! I was laughing til I cried, slapping legs and clapping my hands and all, until finally my husband asked me what I was laughing at, so I read it to him..and he laughed til he cried and his face turned red! That is the best thing I have read in a long, long time! I can just see you ladies rolling on your mosquito netted beds as you worked this out! Lurker here, who considers herself among the respectable variety of English major. Thanks for the great laugh! Some of the funniest stories in my life occurred overseas. I had to make my husband read this post because I was laughing so hard at the monkey alarm. Fantabulous! But I’m just wondering… other than the shock factor what’s to be afraid of about the monkeys? I mean I don’t think they would attack you or anything. Maybe steal something, but they’re not carnivores or anything! English degree here, too. I received mine from the same school as Shannon and they did not offer a class in monkey deterrent to my knowledge but obviously she learned to improvise somewhere! Too funny!!!! From one inside girl to another, I love the monkey alarm. Myself not being an English major, I probably would have just kept the bottle of water and/or sunscreen beside me to throw at the monkey. you must offer up a disclaimer to swallow all drinks before reading such accounts. i’m not sure my keyboard will recover if i continue to douse it with dr. pepper bc of laughing at said account. Who says Latin in a dead language. I am currently a double English/Secondary Ed major at the University of Missouri. Not only am I nodding in agreement with your strategy, but I will teach it to my high school students one day. Oh we laugh now, but Shannon is totally going to make a killing once the patent on that monkey alarm comes through. I just wonder if she’ll have to pay royalties to Ozarka or Coppertone. Oh my. That has to be one of the funniest things I’ve read in a long time! The photo was a must. The visual was just not as good as the real thing. I’ll never look at monkeys, backpacks, bottles of water and sliding glass doors in the same way ever again! I never knew there were so many English major bloggers. I ended up with a degree in English. I did start out with a major in the training of monkeys. Oh, wait, that was elementary education. My mistake. With all the laughing going on, I’m shocked that the photo was in focus!!!!! This is the funniest story E-V-E-R, and I’m so thrilled that you shared it! This was a first for me. . . the first time I have laughed out loud reading a blog. HYSTERICAL!! That is the funniest thing that I have heard in a very long time. I almost wet my pants. Really, I did. Fantastically funny! I love the TRICKED INTO CAMPING line. Well. You have now officially made me pee in my pants whilst sitting at my computer. After i clean up the mess i’m going to submit this contraption yall made to macgyver. Cuz it sounds like it came straight outta one of his episodes. Thank you once again for the fantastic ab workout. I am sure somewhere under their layer of protective covering, they are thankful also. I am laughing so hard I’m crying which is making it hard to type! You two are very funny. I had to read this to my kids because they wanted to know why I kept laughing! One said, “It can’t be THAT funny!” Yep, they were laughing so hard I had to keep stopping so they could hear the rest. Great post! Oh My Word! That is the funniest thing I have seen/read/heard all day! I do believe that is your funniest post ever. Oh I laughed. I laughed until I cried. And OH how I needed to laugh tonight. I’m not an English major, bu I do agree…the sunscreen bottle would have been much more effective than the water bottle. Just woke my kids up laughing. Hysterical!! ‘Tricked into camping’ was my favorite line. Great story…thank you for sharing it with all of us. That’s hilarious! In November my husband & I went to Ethiopia on a mission trip and the hotel we stayed at had monkeys. They didn’t come near our room, but hung out quite a lot by the dining room. Oh my word! That is too funny! I have tears running down my face from laughing so hard! i usually just lurk, but hahahahhahahah!!! you are the funniest. we are going.. or want to go to Uganda next year, will you come with??? i am sure God was especially fond of laughing at the two of you!! Well, now I have had a wonderful “silent laughing” fit, a nice loud coughing fit and tears running down my face. Thank you. I needed that. I have never read a story that made me laugh more! My husband came up from his workshop to see what was so funny–and he nearly laughed himself into an asthma attack! “What about the monkeys?” is my new phrase. I was thinking that maybe the water bottle was an offering. No monkey can pass up some Evian. So I’m listening to an old BooCast (cause what do you do in the middle of a thunderstorm when your husband is out of town?) and laughing at BigMama’s Caroline slinging back shots of pumpkin spice bread and now I’m trying not to wake up the kids laughing at the monkey alarm. Thanks for keeping me company on this rainy night! You know, I think you could use your Fundana(TM) as a last ditch self-defense mechanism in a pinch. Next time you head to Africa, practice hanging from the mosquito netting with one hand, waving the Fundana(TM) with the other, and screaming. I snorted twice and then I started to wheeze. oh man! THAT IS HILARIOUS! Oh my goodness, talk about practically-peeing-my-pants laughing! That is a hilarious story, and so well told. Thanks for the belly workout! THAT is PRICELESS!!! I can only imagine how many tears streamed down your face, and then I’m sure the giggles in the dark as y’all kept thinking about it before falling asleep. I love the fact that you went with it. Wild Monkeys were not near as terrifying as no circulation. Priceless. OK, but did you see any big hairy spiders? I spent a summer in Spain, and my roomie and I set up a similar creation to keep wildlife out of our open air dorm room. It worked quite nicely. I don’t think it was monkey-proof, though. We were dealing more with cats and rabbits and a chicken. You guys are like female MacGyvers. I would pay money — BIG MONEY — to have this story on video. That is hilarious. So funny in fact that I brought on an asthma attack from laughing so hard. (I’ve been fighting a lingering cold, otherwise laughing would not bring on an attack normally.) No worries, my inhaler was nearby. That was just the comedy I needed. Thank you. Boo…this is a classic. It brought much joy to my flu-ridden self. You poor, precious English Majors. What a hoot! I think I would have either decided that a monkey would have better things to do, asked an employee if the monkeys were an issue in the first place, or just slept with the door closed the best I could. OK– here’s my husband’s version of monkey deterrent. A pan of water in which rests a banana– AND also a bare wire connecting to the electric outlet. Oh, except the power was out. I guess the sunscreen was best after all. And I almost wet my pants just now reading about the monkey alarm (patent pending). My husband has just rolled over in disgust, again, after being awakened by all the jostling in the bed from me laughing so hard! I have to go change my pj’s now after wiping my tears on them for the last ten minutes. This is absolutely hilarious and I plan to use some otherwise wasted time sharing this with my co-workers tomorrow. I must remember to stop and buy tissues first. I’m an English major, and I agree! No monkey is getting past the sunscreen-no way, no how. H-I-L-A-R-I-O-U-S. You articulated that perfectly! I laughed until I cried, too…all the way through this post!!! You are too funny! That is the funniest thing I’ve read in a while. Tricked into camping? I totally get that. Because I would have to be. OMGoodness!!!!!!!!!! I just woke my husband up because I was laughing so hard the bed was moving!!!!! This definitely has to be one of your top 10 posts of all time! Thank you so much for sharing the funny!!! If it were not the wee hours of the morning still, I would be laughing out loud! However, I don’t want to wake everybody up. :) Thanks for helping to start my morning off right. Priceless! Thank you and Shannon for making me fall on the floor in hysterical laughter! OHMYLANDS! (to quote some funny lady)Isn’t it just too sweet of our Lord to give us such priceless funny memories in the midst of the life changing, horrific ones? I am so glad that you had such a great time. Oh my gosh, I am laughing soooo hard! I’m too young to need depends, but I’m thinking I need to purchase some before I read your blog again! LOL You are hillarious and so inspiring . . . My newest wanna-be blogging buddy! Thanks for sharing with us all. p.s. Do you really read all these comments? You are sooo funny! I read your blog daily just to make myself laugh! You are an inspiration to me. And in general, a HOOT! Love this monkey story. I am sending your website info to my husband so he can laugh too! oops helps to have the right url!